Question: What type of oil is safe to use in Troy-Bilt lawn mowers? For most Troy-Bilt mowers (both riding mowers and push mowers), you'll want to use a standard motor oil as opposed to specialized small engine oil, but double check the manual that came with your mower to be sure. 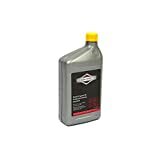 There is no official "Troy-Bilt brand" oil brand, although you can get an OEM (Original Equipment Manufacturer) brand from TroyBilt.com under the MTD brand (the parent company to Troy-Bilt). That said, even on Troy-Bilt's website, they do sell other brand's oil on their website, such as (alongside Kohler, Craftsman, and other brands), so there's clearly not just one brand that will do the trick. So instead of worry about which brand to get, decide on the best type of oil for you based on your specific climate. The SAE (Society of Automotive Engineers) recommends different viscosities depending on your typical temperature range. The main reason we recommend SAE-5W30 oil type is that it works well in a wide range of temperatures, from -40 to 120° F.
Note: If you have an older mower with a two-stroke mower (these are very uncommon) you may need to mix oil with gasoline and specific ratios which you can find in the owner’s manual that came with the mower. But you don’t have to worry about this for most modern push mowers. Hopefully this answers your question. If you need further clarification or have any tips or recommendations you’d like to share, please leave a comment below!